Q1. Please tell our readers your thoughts about the progression of the role of the senior command sergeant major at the Sergeants Major Academy and especially the elevation of the position as the Commandant? The role of the Command Sergeant Major at the United States Sergeants Major Academy has transitioned a great deal since 2009 when SMA Ray Chandler became our first enlisted Commandant. The decision to have an all enlisted lead the Academy with a CSM as the Commandant is one which cannot be taken lightly or for granted. Serving as the 21st Commandant has proven to be the most demanding and toughest position I have ever held in my 29-years of service. The responsibility associated with the position are at times overwhelming. Without a great wingman such as my Deputy Commandant it would be overwhelming. The elevation of the position of a CSM to Commandant demonstrates the level of trust and confidence our Army has in senior enlisted leaders. The Commandant is trusted to manage a $15 million dollar budget as well as the development and execution of 14 programs for the Army. The Academy provides education and develops leaders at every level from PVT to CSM. As an example of the magnitude of Soldiers we touch from the Academy, in FY13 we had 292,000 scheduled for training. Q2. 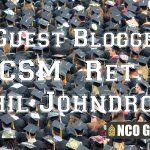 In your assessment how has the Noncommissioned Officer Education System changed in the last 10 years? The NCO Education System over the last 10 years has evolved to one which is more responsive to the needs of the leader on the ground. As an example, monthly we conduct an academic review board to ensure lessons learned from the war are being captured and curriculum is adjusted to ensure it remains relevant. Another is the quality of instructors and the new instructor development system recently implemented which ensures the delivery of education is from those with combat experience and the best NCOs from the field. However, as we move forward and take a look at where we think we need to be we have found some adjustments to the system which are required. Currently we are looking at what skills our NCO Corps will require as well as the process needed in developing our NCOs. This initiative is call NCO 2020. One of the major changes is the shift from the mindset that the only professional military education (PME) are the four levels at our academies. Rather we are changing from NCOES to a NCOPDS (NCO Professional Development System). This new system will capture all required development needed to credential a leader at each level. This fits well with our Army Profession in that a professional should be credentialed. Also, the other key factor is that we are partnering with the field to capture the development of our leaders which takes place 84% of the time. Together we will leverage an NCOs experience into our Academies as we raise the level of education and quality of our NCO Corps. Q3. Has the introduction of Structured Self Development replaced the requirement for other Self Development requirements, and if so, how? The introduction of SSD is intended to add yet another level of self development i.e. structured. Self development has always been and will most likely always be a valuable tool critical for the development of our NCO Corps. Our Soldiers and NCOs must continue to read, study and expand our knowledge base. This is what sets us apart from many other Army’s. Self Development is a critical element of being a member of our profession. Q4. What advice do you have for soldiers about to attend the Warrior Leaders Course? 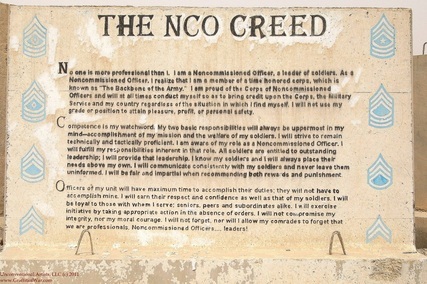 The WLC provides a good foundation of what the core qualities of a NCO should know in order to better serve as a leader. As you prepare to attend WLC ensure you are physically ready for the challenge. Leading by example is an element all soldier look for in their leaders. Be mentally ready, take to time to self reflect on the information presented during each lesson as well as the exchange of ideas among your peers. Learn from each other. Finally, when you complete the course, be the professional NCO we expect. Take the newly gained knowledge back to your formations and make them better. Don’t bash our program or Corps, after all, you are only bashing yourself because you have now been indoctrinated into the Corps. So, make it the best Corps that only winners want to be part of. Q5. What do you think we could do to best improve noncommissioned officer education? We need to always ensure our NCO education challenges our leaders both intellectually and physically. Many of the improvements which will occur over the next few years as we move forward with the NCO 2020 strategy will lead to an even better NCO Professional Development System. We need feedback from the field on what a NCO at each level needs to know and be able to do, and then we will better build the education platform to produce the leader needed on the battlefield. Q6. Who is your most admired person, and why? The most admired person I hold in the high regard is my grandfather, George David McClintock. His wisdom is unmatched by any other leader whom I have served. A lot of my values base and character comes from the many years I spent growing up with my grandfather and living with him. He never had it easy and I am not sure he would have wanted it any other way. He was born in the 1920’s and raised his four kids during some tough times to include the depression, WWII, and other challenging events our nation faced. He loved his country very much and was the first to vote in every election. We never had much money however, earning an honest living and giving a full days work was something heard often. He never accepted excuses or allowed for whining. Being a man was a must and overcoming life’s challenges only made you stronger. He lived by example and was the leader of our family. Often we would hear the statement that nothing is free and he certainly did not believe in any “free chicken” and despised a “free loader”. He was challenged in life from the start when at the age of 3 he contracted Polio. He underwent several surgeries which left him with a set of legs and feet which would require him to walk with crutches the rest of his life and never have the opportunity to ever run one step. His arms were huge from lifting himself in to vehicles or pulling himself up. One thing he never allowed anyone to call him was handicap. He never had a special license plate or a handicap placard. In fact, this would have most likely lead to a good fight. 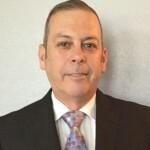 In stead, he worked hard as a Heavy Equipment Operator, operating a Grader for the Washington County Department of Transportation until he was eligible to retire. My first job was cutting grass which he bought me a push mower for $100 and required I pay him back, an agreement entered into with the shake of the hand. I not only cut grass for $3 to $5 a lawn but was also encouraged to cut some of the elderly ladies lawns for free. This taught me a lot and drove my desire to serve others. He would do the same on his riding lawn mower all summer. When I told him I had joined the Army he told me to give 100%, do my best and no one could ever complain. He was the first to support my decision and to believe in me as I departed for the Army. And now 29 years later, the rest is history. As you can see I am passionate about telling folks about my grandfather. I was blessed to be raised by a great family full of loving parents, grandparents, aunts, uncles, cousins, and the best two brothers and sister a person could ever ask for. We didn’t have much money, no new cars, loved getting hand-me-downs, and certainly Sunday family gatherings were the best. What we did have was something no amount of money can every buy, we had Love and took care of each other. Q7. In your opinion, what is a Sergeant? A SGT is the most lethal weapon we have in our inventory. They are the ones at the pointy tip of the spear which makes all things happen on a daily bases. A SGT is our first line of defense for standards, discipline, accountability, and looking out for the welfare of our soldiers. They do this by training them under tough and realistic conditions which not only develops a warrior who is capable of defeating any enemy on the field of battle but one which is also resilient. A SGT is suppose to be the expert trainer who spends all their time training the soldiers they lead. The SGT is the standard and example in all things from fitness to understanding those things that reinforce discipline from the wear of the uniform to ethical decision making. A SGT understands how to and when to coach vs. counsel vs. teach vs. mentor, each of which are different. Q8. 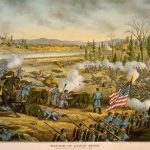 How is the Army doing at capturing the History of the Noncommissioned Officer, and what role does the Noncommissioned Officer Museum play? If I were to give the Army a grade on how we are doing at capturing our history, I would give us a C+ at best. Far too often we as NCOs don’t take the time to record all the great things which we are a key member in our history. We also must do better at writing articles and being published in documents such as the NCO Journal, the Army Magazine, branch magazines and even books. Telling the Army story now will help our Army over the next 10 to 20 years as we fully realize the impact of the GWOT. The NCO Museum at Ft Bliss and is yet another tool available to our Army and NCO Corps. 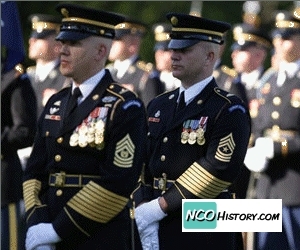 Recently the US Army Sergeants Major Academy renamed the NCO Museum to the NCO Heritage Center. This initiative will allow the former museum to transition to a center where meetings and conferences are held. The change also embraces that of the Academy’s mission which is to educate. Currently we are using the NCO Heritage Center to capture literature and items from across our Army so that soldiers and leaders can study them and learn from our history. This new approach is proving to be very beneficial as we build upon our capacity and incorporate our history into all levels of NCO education. Q9. If you were going to write a book, what would you call it and what would it be about? I do have thoughts on writing a book and have been working on some of the content. As a concept I think the book will contain stories from everyday situations about life’s challenges which in the end make us stronger and we all grow and become better from the experience. A title will be something along the line of, Moments of Inspiration. I am still working on the title. 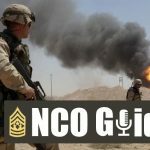 I personally appreciate the information provided from this interview for the NCOs in the field. In the short time I’ve been assigned to the USASMA, since June 2013, I’ve seen first-hand the positive impact CSM Malloy has made as Commandant during his 3-years. His strategic focus is unmatched at the nominative 3/4-star CSM level. He is the example of the positive transformation our NCO Corps has made to arm our senior enlisted advisors with the Skills, Knowledge, and Attributes (SKAs). I hope to see him continue to serve at higher levels in our Army, so he can continue to ahpe the future for the NCO Corps. It is great to see and especially hear from our senior noncommissioned officers. We hear all the time that we need to tell both the Army story and our own Soldier stories and we aren’t always very good at it. This allows the audience inside and outside the Army to hear that story, and hopeful understand where the Army is headed, in this example with CSM Malloy, showing where NCODPS is headed with regard to NCO 2020. The force needs to know we are committed to the continuous improvement to the education of our noncommissioned officers. Well done! Top class interview and very articulated. This should now become the standard for our Sr NCOs. Thank you CSM for taking the lead. This is a comment from Class 11, last Century. After completing the Non-Resident Course, I was still assigned as Class President. I stayed on the faculty for almost three years. Col Crow, the Commandant then told some of us of our responsibilities to make the NCODP work. He also mentioned that everyone knew we took care of our Soldiers. What he inferred is that we as Senior NCOs make sure that new Lt gets his career started with good advice and help from the experienced NCO. An example was the relationship of the PSG and Platoon Leader. This was the way the infantry did it and it needed more emphasis Army-wide. The Wehrmacht had a similar philosophy. The experienced training the inexperienced. I saw the British Army Sergeant Major being given several new Lieutenants to get them trained and to give the Commander a run down on how well they did and their interactions with the unit. When I was IG SGM in the 25th Infantry Division 76-77, the IG started a program where our team would get a fresh crop of recently assigned LT’s. We had them for three months. I was the Company/Bn Admin inspector and we had another with tech svcs NCO’s. The third was complaints. We each had them for a month. We taught them hands on. They new duty rosters, company admin, and how the PAC worked. After rotation, they went back to their units with enough experience where a dishonest (yes we have a few) Sgt could not pull the wool over their eyes. I later received a letter from a Major who went through this training. He said it was valuable to him and showed him what NCOs could do. What I suggest is that the Army take a look at this just a little. I have watched the NCO Corps develop over the years since my retirement and I am truly pleased. Thanks for the good work. 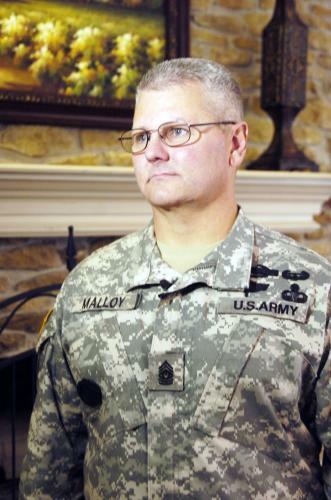 I served with CSM Malloy HHC 3/327 IN 101 ABN in the late 90’s and I always looked up to him and respected his leadership style. Awesome Q&A between the Commandant and CSM (Ret) Elder. What I appreciated most of the Q&A were first, the importance on having an NCO Corps that is both intellectually and strategically competent; and yes that will mandate learning outside or in addition to our traditional NCOES programs. Second it was the expression of the importance of the lethality of the Sergeant. 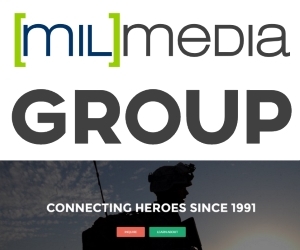 Absolutely the greatest force multiplier! In closing, although virtual learning has a place in education, there is much research in the civilian sector (I am currently an educator) that suggest the continued need for “brick and mortar” learning. I humbly close as a proud Alum of the NCO Corps and USASMA. Peace.